Led by Kansas City’s pre-eminent ceramic artist Jim Leedy and hosted by Red Deer College’s Artist Residency Program, Columns features the collaborative work of 22 students and five artists from three nations. 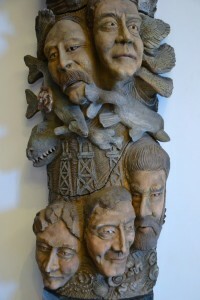 The five 10-foot-high clay totems are incredibly rich with texture, and comprise iconic faces and symbols of Alberta’s unique character and history. Jim Leedy, together with hundreds of visitors to the 1992 Works Festival, created the four additional murals. Torbjorn Kvasbo (Venabygd, Norway) captures the essence of Alberta; plowed fields, wilderness, mountains and the Badlands, all of which exude a fertile rawness. Using patterns, rich surface and monolithic form it forever preserves the energy that is Alberta. Ole Lislerud (Bergen, Norway) was intrigued by the rock expansiveness of Alberta. Concentrating on patchwork pattern and minimal form, his column is reminiscent of an aerial view. The buffalo horns and a red deer project feelings of whimsical playfulness. Jim Leedy‘s (Kansas City) column celebrates life. He created a kaleidoscopic collage of historical figures, mythical creatures and Alberta vignettes. The columns reflect the cultural vibrancy of Edmonton. Randy Schmidt (Tempe, Arizona) takes a light-hearted view of Edmonton and Alberta, past and present. His two columns exhibit individuals with historical references and contemporary Edmontonians. A sense of Edmonton’s multicultural vitality is evident. Chuck Wissinger (Kingsville, Texas, formerly of Red Deer) produced two columns himself. Then, with the assistance of Red Deer College students, produced two more columns which are literal in nature. They feature an overview of Alberta’s history, everything from Pre-Cambrian fossils and dinosaurs, two Ice Age mammals and aboriginal cultures, to European settlement and the new City Hall. The collaborative artist team includes the five international artists mentioned as well as the Red Deer College fine arts students, Steve Coffey as project coordinator, Gregory Stirling, Wendy Berry, Thomas Aitken, Lyndon McClaren, Tom Beebe, Denise Contente and Brenda Lakeman. Biographies: Widely considered the “father of the Crossroads Arts District” in downtown Kansas City, Jim Leedy has shown his work in a variety of media in more than 100 major exhibitions throughout the U.S. and abroad, including museums in Europe and solo exhibitions at the American Craft Museum in New York, the Kohler Arts Center in Wisconsin, the University of Kansas in Lawrence and a large installation at the International Arts Exposition in Chicago. Charles Wissinger enjoyed a 25-year career at Red Deer College teaching ceramics, drawing, sculpture and photography. He was born in Pennsylvania and in 1970 received his Master of Fine Arts, with a major in Ceramics and minors in Sculpture and Photography-Cinematography from Ohio State University. In 2000, Wissinger moved to Texas to teach at the University of Texas-Pan American. Today he is the Director of the Art Department at Texas A&M University, Kingsville. Sponsored by: GWL Realty Advisors Inc. & The Places. The Works gratefully acknowledges the contribution of Culpepper Alberta Energy Company Ltd., Canadian Airlines International, City Centre, Chieftain International Inc. and Red Deer College for their donations to the Works 1992 Legacy project.